OXFORD, Miss. – A two-month study being conducted by a group of University of Mississippi researchers promises to provide insights into the time course/mechanisms behind increases in muscular strength following a resistance exercise program. 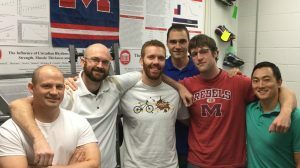 #OleMissMuscle, a six-member team of exercise physiologists, began the study, which is sponsored by the university, in mid-September by recruiting 25 female and 15 male subjects to work out on two different machines in the university’s Kevser Ermin Applied Physiology Laboratory. The researchers analyzed each participant’s muscle composition before they launched into the program. At its conclusion, the research team will monitor their muscle progression through post-test results. The research is important, as some suggest that increasing and maintaining a high level of strength is essential for maintaining a high level of function throughout life. Other members of the team are fellow doctoral students Sam Buckner of Ft. Lauderdale, Florida, Grant Mouser of Norman, Oklahoma, Kevin Mattocks of Pittsburgh, and Matthew Jessee of Hickory, North Carolina. Following this study, the team will start another project, investigating the blood flow, muscular and cardiovascular effects of resistance exercise with and without differing levels of blood flow restriction. #OleMissMuscle has been studying muscular growth for approximately three years. While most studies incorporate muscle physiology and adaptation to resistance training, the UM team’s expertise is in the potential physiologic benefits of acute blood flow restriction, a technique that partially restricts blood flow into the muscle but does not cut off arterial flow completely. “In doing so, we can increase muscle size and strength with very light weights, which are adaptations previously thought to only occur with heavy weights,” Loenneke said. Results from previous studies have been published in journals such as Sports Medicine, Physiology and Behavior, Muscle and Nerve and others. The majority of the group’s work is on low-load exercise in combination with blood flow restriction, a technique being used more frequently in rehabilitation settings. For more information about #OleMissMuscle, contact Jeremy Loenneke at jploenne@olemiss.edu.